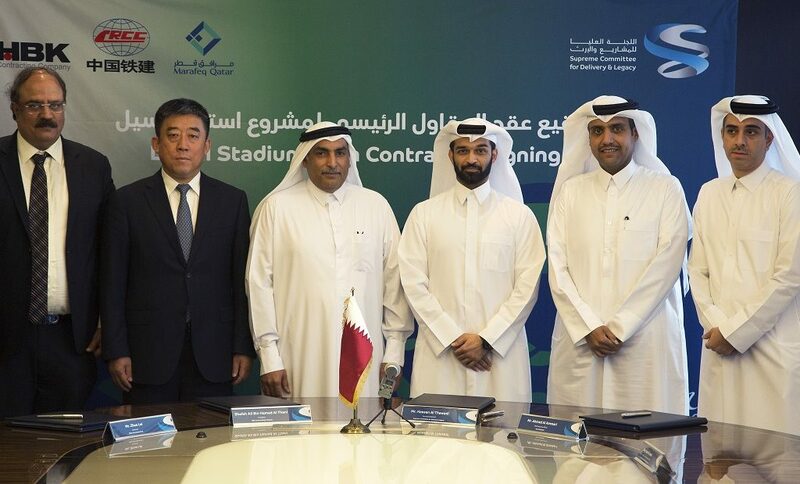 A joint venture of Qatari contractor HBK Contracting Co. (HBK) and China Railway Construction Corporation Limited (CRCC) has been awarded the main contract to build Lusail Stadium, the venue for the opening and final matches of the 2022 FIFA World Cup Qatar. British architectural firm Foster + Partners completed the schematic design earlier this year for the 80,000-seater stadium, to be located in Lusail City just 20km north of Qatars capital Doha. The stadium is located on a one square kilometer precinct plot along the Al Khor Expressway in the western edge of Lusail City. The long term development plans for the precinct include various unique developments such as a Theatre District that will be the Middle Easts first of the kind. The SC has also awarded Marafeq with a deal to supply district cooling to the stadium. Marafeq will provide up to 30,000 tons of refrigeration to serve the stadium before and during the tournament. All eight stadiums currently under construction across Qatar for the 2022 FIFA World Cup will feature innovative cooling technology. Lusail stadium site construction began in 2014, with TIME Qatar as the project managers. Most recently early works and site office construction projects were completed by Galfar Al Misnad, with levelling and grading works and site and access roads completed by local contractor Marbu Contracting. By the end of 2016, the main-works contractor will be mobilised on site and the SC plans to reveal the final stadium design to the world in early 2017. Earlier this year, main works were awarded to Al Rayyan Stadium and Qatar Foundation Stadium, which joined Khalifa International Stadium, Al Bayt Stadium in Al Khor City and Al Wakrah Stadium in construction main works stage.